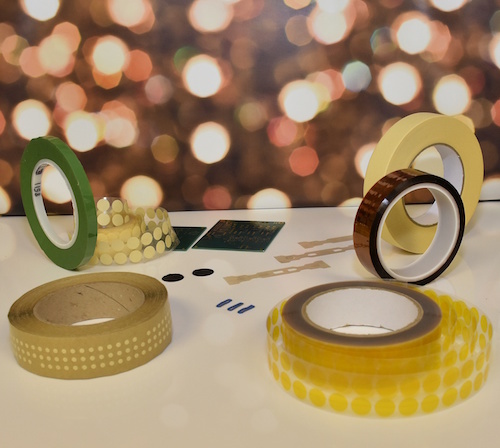 Supplier Database – "Expertise, Right Across the Board"
Elder Tapes and Rubber, a division of Elder Engineering (Herts) Ltd, now offer a new range of electronic and conformal coating masking tapes and dots. Our popular electronic and conformal coating masking materials can be stocked as master logs and then slit to your required width; from 3mm to the full master width. Our materials are also available in dots and other shapes of standard sizes or custom sizes. ET600 – Polyimide tape + silicone adhesive – for general and high temperature applications. Find out more about Elders NEW conformal coating tapes here. Nexus have introduced a section to allow distributors to be linked to the conformal coating material and equipment suppliers. This allows the user to find the local representative for a material quickly and easily all within the same resource. This is also linked through the Material Selection Guide so once you have decided which conformal coating materials you want further information from you can contact the distributor if they have signed up for the service. This Service goes live on Monday 18th June. For further information go to Nexus and look at THE INDEPENDENT conformal Coating Resource. Looking for dispensing equipment to dispense conformal coatings, adhesives, potting compounds or other materials.